We take that whole golden rule thing to heart. C&R Auto Repair is a family-owned, full-service repair shop. We’ve been taking care of cars, trucks and customers since February of 1983. Last time we counted, we had more than 3,000 loyal customers, including the good folks at the State of Texas Commission on Environmental Quality. We’re ASE certified, and we’re a certified emissions inspection facility for AirCheckTexas, a program that helps lower-income drivers keep their cars in compliance with air quality standards. 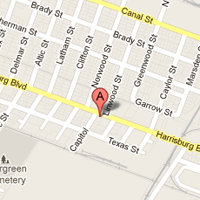 You can find us at 5902 Harrisburg Blvd in Houston’s East End. We’re open from 8:30 to 5:30 Monday through Friday, and 8:30 to 1:00 on Saturdays. Join us on Twitter for more news and updates.